In the Egyptian model story [in the previous chapter], Osiris wasn’t actually dead at first—he was in a coma; a state of complete unawareness where people think they’re awake and aware, but they aren’t. To bring about the Hope [Horus] and to make him manifest, people have to resurrect Osiris to bring him out of the coma. This is how our souls and spirits and life essence are able to pass from this world into the more evolved states of creation towards divine union. The central figure of the ancient Egyptian religion was Osiris, and the chief fundamentals of his cult were the belief in his divinity, death, resurrection, and absolute control of the destinies of the bodies and souls of men. The central point of each Osirian’s religion was his hope of resurrection in a transformed body and of immortality, which could only be realized by him through the death and resurrection of Osiris. All dead persons were/are equated to Osiris, because Osiris is a cosmic principle and not a historical person. 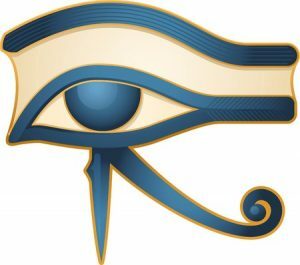 The Egyptian religion was an inclusive religion where Osiris lives within each of us, which facilitated a true understanding of who we are and who we are intended to become. The principle that makes life come from apparent death was/is called Osiris, who symbolizes the power of renewal. Osiris represents the process, growth, and the underlying cyclical aspects of the universe. From the earliest period of Ancient Egyptian history, the Egyptians believed that Osiris was of divine origin partly divine and partly human, who had raised himself from the dead without having seen corruption. What Osiris had effected for himself, he could effect for man. As a model, the Ancient Egyptians believed that what Osiris did, they could do. Because he had conquered death, the righteous too might conquer death and attain everlasting life. They would rise again and attain everlasting life. Shown below is one of the numerous illustrations showing the Resurrection Principle — Osiris. 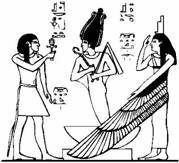 On the left, the bearded neter (god) presents “life” (the ankh) to him and voicing words of power. 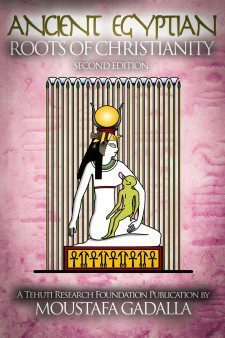 The theme in the Egyptian Book of the Caverns talks about the necessity for death and dissolution (of the carnal and material) prior to the birth of the spiritual. … that which thou sowest is not quickened, except it die. Another example is the biblical wine symbolism, which can be traced to Ancient Egypt where the walls of the Ancient Egyptian tombs show vintners pressing new wine [as per the above Ancient Egyptian tomb scene], and wine-making is everywhere a constant metaphor of spiritual processes and the themes of transformation and inner power. The soul, or the portion of god within, causes the divine ferment in the body of life. It’s developed there, as on the vine, by the sun of man’s spiritual self. The fermented potency of wine was, at its deepest spiritual level, a symbol of the presence of the incarnated God within the spiritually aware person. The progression along the spiritual Path is acquired through striving, and is a matter of conscious disciplined action. Each new/raised consciousness is equivalent to a new awakening. The levels of consciousness are referred to as death—rebirth. Such thinking has pervaded Ancient (and present-day) Egypt, where birth and rebirth are a constant theme. The word death is employed in a figurative sense. The theme that man must “die before he dies” or that he must be “born again” in his present life is taken symbolically, or is commemorated by a ritual. In this, the candidate has to pass through certain specific experiences (technically termed “deaths”). A good example is baptism, which was the main objective at Easter, after Lent, representing death of the old self by immersing into water and the rising of the new/renewed self by coming out of the water.